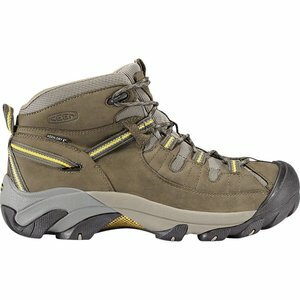 Lacing up the Keen Men's Targhee Mid II Hiking Shoes is like shifting your feet into four-wheel drive. The 4mm lugs grab rough terrain, while the waterproof and super-breathable eVENT insert keeps your feet dry. The dual density, compression-molded EVA midsoles cushion and absorb shock so you can return to the trailhead without achy feet. The mid-height cut protects your ankle from rolls and twists, and Keen's S3 heel support structure cups your heel so you experience less slippage and less blisters.